1) OMG RACHEL WORE THE SOUTHWARD STOP SHIRTDRESS ON GLEE LAST NIGHT!!! I got to shout "Look! It's my dress - AGAIN!!!" Yay! Higgledy-Piggledy Skirt in a maroon color for $56, A Fine Line Skirt for $56, and the Fluttering Pencil Skirt. Ok, on to the OOTD. Today I'm breaking the rules for Elaine. She asked people what clothing rules they have and if they've ever broken them. I don't really have explicit clothing rules for the most part. Well, maybe I have one: I try not to wear skirts that fall between my knee and my ankles - despite the current trend to do so. I have short legs, and skirts that length just make them look shorter. But I figured I might as well try it out anyway. I have a few skirts in my closet that I haven't decided to shorten yet, and one dress that I wouldn't shorten. They've been sitting around, twiddling their thumbs because I can't decide what to do with them. Take today's MaxMara skirt. I thrifted this from Goodwill back in June for $6. It was too long on me, especially if I let it sit at my hips. This is actually my most winter appropriate skirt as it's made of very thick wool and lined (and it has thick warm pockets!). Actually, when I first bought this skirt, I didn't like it - or I couldn't tell if I liked it. In part because of the length, in part because of the bulk of the thick wool. I think I was anti-bulky wool because I picked it up in the summer. I quite liked the bulky wool today. I just pinned it slightly smaller to fit at my waist so that it didn't go too far below my knees. Ok. so that's kinda cheating at breaking the rules. I'm cheating on what I'm supposed to be cheating. But it definitely hits below the knee, forcing me to wear heels to make my legs look longer. I also kept to dark tights and dark heels so not to break up my legs into more visual pieces. Maybe tomorrow I'll go for broke and really break the rules. I LOVE that skirt! I think you look fantastic! I'm not even five feet tall and have had to come to the realization that looking short doesn't mean looking bad. It's okay if I wear a skirt below the knees that makes me look short. It's still cute. And you, my dear, are adorable! I screamed the same thing when I saw that dress on Rachel and it scared the bajeezes out of Chris. Haha. You are brave for wearing that skirt and it looks great on you. I can't pull this look off because I have stubby legs, in addition to them being short. Boo! It's a winter skirt, for sure, but I don't think it's bad at all! I have the same problem with short legs and wide hips, but I guess there are always ways that you can work around it. Very cute look! I think this length of skirt looks great on you! You are not short. And this skirt length definately doesn't make you look shorter. I think you are just pulling our legs so we can be taller. Haha! Now if the skirt had been full, that would be a problem. I'm almost 5'6" and a full skirt makes me look short and stocky. Which I'm not. My Jacquard Gala Dress by Ruffian is extremely full and has a high waist. I wised up and added a belt to pull the waist down. I was pleased with the results. It worked. You are having too much fun hoping around the house Miss Lori. I really like this look -- very Scottish highlands, in a good way. And I think this skirt had amazing details -- I love the pleating in the front. I also adore your plaid dress/top. 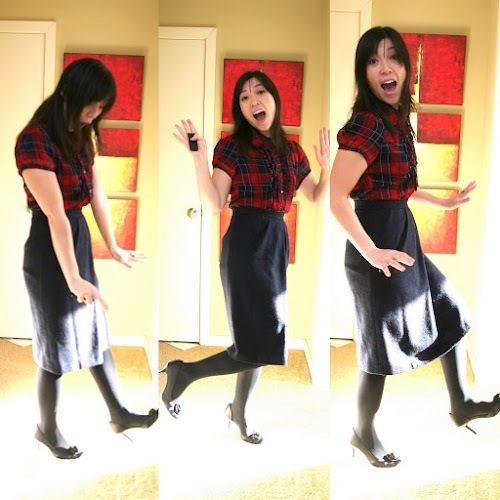 I have been mad for plaid recently -- bought three plaid shirts in about three days, and I STILL want to buy this dress for myself!